The Hayrack Shop stocks a good range of quality, branded horse and animal feed. We have weekly deliveries of horse food so if you require a feed that is not currently in stock, we can put it on order for you. For an order to arrive the same week, it must be ordered by Thursday morning at the latest to be ready for collection on Friday afternoon. Original and Oil - Conditioning fibre feed for horses and ponies. Fibre Beet and Sugar Beet - Quick soaking feed provides a multitude of benefits to horses. 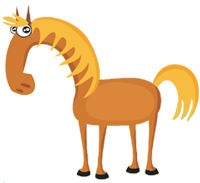 Healthy Hooves - nutritionally complete, low calorie fibre feed for horses and ponies prone to laminitis and; Hi-Fi - High fibre feed. Silver & Gold - Complete food formulated for sporting and working dogs. So what are people saying about Hayrack Church Farm? Please read our testimonials page to find out!